Cat legs are not connected to their body when they are sitting. Mod Note by [MCPE Mod] Dr.Awesome4333: We understand and can reproduce the issue, please do NOT add any more pictures. 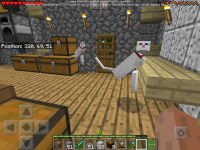 MCPE-38357 The cats look very weird and glitched when sitting. MCPE-38682 Extremely weird looking sitting cats. MCPE-38784 When the cats sit down, the legs are not even enter.